Requested: Are The Muppets Communists? Caveat: This post makes heavy reference to a segment from Fox News’ Follow The Money regarding Walt Disney Pictures’ The Muppets, watching is recommended but not required. When I was but a wee boy, my family had a Rolls Royce. We had a driver–Sam–a leather-jacketed man who smoked constantly but never in my presence who, at my slightest behest, would drive me to McDonalds, Toys-R-Us, the twin nuclei of American wee boy desire. Occasionally, en route, government mandate would force us to stop at red lights with the non-Rolls-Royce-having public. Considerable gawking would commence from the neighboring autos, and I would be prompted to produce strawberries on the back seat window’s glass, all in good fun. “Why do they look upon us in such a manner, Sam?” I’d precociously ask. Sam lied to me. Comrade Jim Henson found his way into my sterling being, and his mind-ringworm has negated any chance of my achieving the American Dream of owning a Rolls Royce. My entire perception of the world has been poisoned by reason and logic by the left wing media, by The Muppets and their communist ilk. My dreams are bereft of the joys of corporate life. I cannot even envisage working for a corporation, much less owning one. I yearn for just political and financial systems that enable every individual contained within their spheres of influence the greatest possible opportunities to provide for those most dear to them. 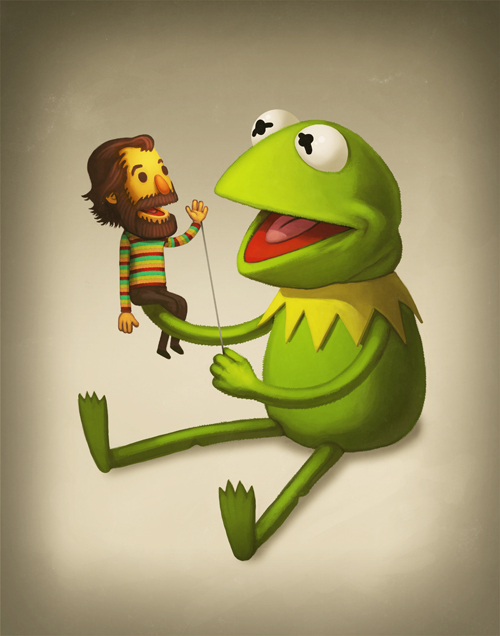 Thank you, Jim Henson. Thanks to Jim Henson, I believe that I live in The Matrix. I should have known, should have recognized the telltale signs. Kermit the Frog with his existential musings. Fozzie Bear with his unwavering loyalty to others. Animal with his chthonic rock music. Gonzo and his Mediterranean nose. Those meddling scientists and their stem-cell research. Miss Piggy’s resemblance to Sam Tacon. It was all there, and I could not see it. They were Muppets, but they were also Communists. Now I am undone, and my only solace is knowing that The Muppets was produced by Disney, a corporation. And though Disney may only have an Evil Index of 8.5 out of 10, I can rest assured that Fox News leveraged the absolute farce of Disney’s brainwashing of children in their brainwashing of adults, which is allowed, and encouraged, and will one lead to Walt Disney’s reanimated head being elected President of Wal-Mart, and everyone will have a Rolls Royce, as it should be.